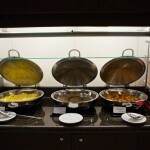 There are many times when I am eating breakfast in a hotel when I wonder why hotels even offer buffets for breakfast in their restaurants. I can see the answers from the executives now; “It is a faster breakfast for our busy guests!” Or, “The costs will be lower due to the high volume and less staffing!” Or, “Our guests prefer to have a buffet!” What I usually see when hotels offer buffets though, is terrible service. I am sure the guests do not prefer bad service! It is not that buffets and bad service go hand in hand, but it really gives servers a reason to become lazy. The fact is that almost everyone will tip, whether or not they received good service, when they eat at a breakfast buffet. The line between the self-service aspect of a buffet and the service side from the server often becomes blurred and a guest will just tip the customary ten to fifteen percent of the check no matter what type of service they receive, just to be courteous. Nowadays, there are not many service oriented managers that do not know that the last impression a hotel makes on a guest, usually at breakfast, can heavily affect guest service scores. Most people also probably know that customers would prefer no service to bad service (thus the invention of ATM machines). Why then, would a hotel allow this type of service to go out to their guests in hopes of saving some money? If you have a subpar breakfast buffet service, make sure that you have the following items in place to change that service for the better. Standards – Ensure that your staff is familiar with the standards of your hotel brand and follows them. If you do not have a brand, make some standards and follow them. Host – Have a host. This may seem like a useless cost, but having a host seat guests will make the restaurant seem more like a restaurant and not like a cafeteria.